I love making or decorating desserts with strawberries. That’s why you will find several recipes on the blog that I have made with them, like chocolate covered strawberries, tres leches cake and the famous strawberries and cream that is so popular in Colombia. 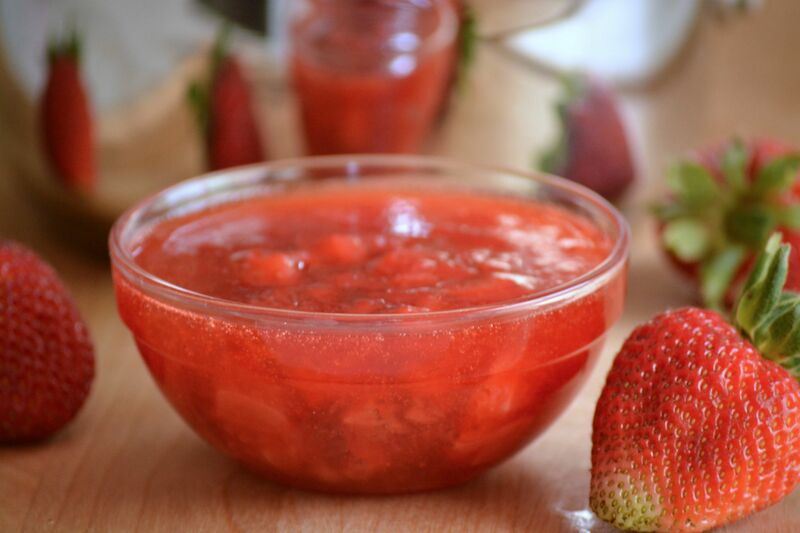 And today’s entry is another delicious recipe, a strawberry sauce that you can serve with pancakes, ice cream or use it to decorate cakes and cheesecakes. Making it couldn’t be simpler and easier. Some times we eat it way too quickly at home but in less than 20 minutes I can easily make a fresh new batch. Not only that, but it tastes way better than the pre-made sauces you find at the grocery store, not to mention that they are also healthier. And try to serve it with all kinds of desserts, cookies, pancakes, waffles, you could even use it to make a delicious strawberry lemonade. In a small saucepan mix the strawberries, white sugar, water and lemon juice. Bring it to a boil over medium heat and cook at a slow simmer (low) for 5 minutes. 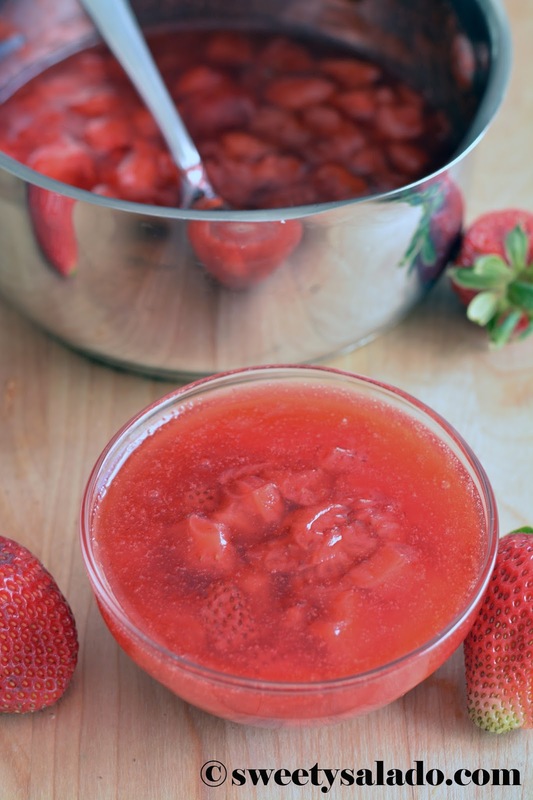 In the meantime, stir the cornstarch and 2 tbsp of water in a small bowl and add this mixture to the cooked strawberries. Remove from the heat and add the vanilla extract. Stir well and let it cool completely before serving. This sauce can be stored in the fridge in an airtight bottle or container for up to one week. How can I make this sauce a little thicker so that I can use it to pipe designs onto a cake? Thanks so much! The sauce will thicken as it cools but you could also add more cornstarch, not sure if that will make it thick enough for piping. If you need a recipe for piping, then a recipe for piping gel would work best.